PolivkaVox: Flipping the classroom. It's time. Flipping the classroom. It's time. For years I've been talking about how online learning creates a "reversal of fortune," because in a classroom the student is entirely on the teacher's turf, but as soon as you put learning online it's the opposite. It's the teacher and the learning that has to adapt to the student's personal environment. This reversal has enormous ramifications, the top of the heap being that online learning must now be considered a product in ways the classroom does not. You can't assume learners will follow your rules just because you say so. The reversal of fortune has now evolved, and its offspring is the flipped classroom. First let me define The term, so there's no confusion: "Flipping the classroom" is, at its most basic, asking students to learn the content at home and practice it in the classroom, instead of the other way around. When the Internet is available everywhere, there's no earthly reason that valuable class time should be wasted on lectures. Those can be recorded and watched at home. And then that valuable class time can be used to mentor, coach, facilitate, interact, answer questions, test, and in every possible way to make sure each student has learned the material and can put it to appropriate use. Pearson has been flipping the classroom with its MyMathLab product for years, though sometimes without the knowledge of the faculty. I've blogged about this in past posts. The MyMathLab product presents itself as homework, but in fact it teaches. Teachers can choose either to flip the classroom by assigning the homework first, then talking it through and practicing it in the next class session, or they can just pretend that their lectures have suddenly gotten much better (I'm sure this is rare) and reap the rewards of an almost-foolproof homework assignment. So how does this relate to the online learning "reversal of fortune?" The flipped classroom grew out of it. It's a part of it. Without quality online content of some sort, students are not going to be able to learn the content by themselves at home. After all, teachers have been assigning a textbook chapter to be read ahead of class for years. Textbooks are just not effective enough to actually teach. In order for the classroom to be effectively flipped, you need to have a highly effective learning product online. And that's where it becomes necessary to "productize" learning, to think through all the product details (look, feel, flow, interfaces--and the simple focus on the right content at the right time in the right manner to the right audience). Let's take a case in point, which has recently hit the national consciousness through "60 Minutes," Kahn Academy. Parents and their kids have known about this homework secret weapon for years. Kahn Academy is not where you go when you want to practice what you've learned in class; it's where you go when you don't get it. It's where you go when what was taught in class just didn't make any sense, and Mom and Dad can't help. 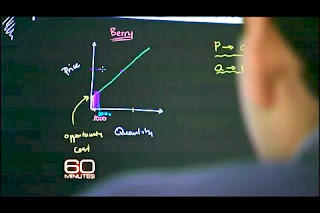 Kahn Academy is, or at least it was, little more than a collection of mini-lectures that teach math and science concepts through the simple device of a really gifted teacher, Sal Kahn, talking aloud while writing and illustrating in multiple colors on a black screen. Nothing could be simpler. Or could it? The fact is it's not nearly as easy as it looks... it has taken off not because of the format, but because Sal Kahn has this amazing capacity for explaining the complicated in very simple ways. As 60 Minutes pointed out, some teachers resent him because they think of themselves as lecturers, and he's better at it. Others embrace him because they know they are really educators, and he helps their students actually learn. And to those teachers who do get it, Sal Kahn is not replacing them; he's replacing the textbook. He is the textbook. He is the chapter of the textbook that can be assigned ahead of class time, so that students arrive already familiar with the concepts. Except unlike a traditional textbook, with Sal Kahn they actually will learn ahead of time. Sal knows, as do all those teachers who use his stuff, that a series of video lectures does not an education make. In fact, Sal knows this so well that he has (with a little help from his new friend Bill Gates) built a Learning Management System for teachers to use, to help them facilitate learning in their classrooms. The result is something truly innovative. I'm going to say that it might even be the first truly new technology that has been designed exclusively for higher-levels of learning (say, above 6th grade); the first one that doesn't just borrow technologies created for entertainment or communications. It has an enormous capacity to change the way education works, because it is designed for no other purpose than to make sure education works. What a concept. But Kahn Academy is not the only entity contributing to the classroom flip. Check out Sophia.org. This is a technology that all teachers can use to flip their own classrooms, right now, today. You don't need Sal for this... you can put your own lectures or lessons online and start assigning them as pre-work for the study sessions you have in the face-to-face classroom. What does all this mean? It means that online learning, eLearning, distance learning, is having its inevitable impact. The inevitable is this: education will progress down the path of technology just as entertainment has, just as communications have. More and more of it will be mediated through technology. Why? Because people will keep finding ways in which using technology actually improves learning. Flipping the classroom is only the beginning. We are still scratching the surface. But that scratch is starting to satisfy a much bigger itch. I want to point out that what is so wonderful about Khan Academy and learning Algebra I is that he has put together a good scope and sequence of learning Algebra I. Students can cover all the topics he covers and know that they are fully prepared to enter Algebra II class with a solid foundation. In the real classroom, students often do not cover all the topics of Algebra I and start Algebra II without a solid foundation. Students can do Khan Academy all year, even through the summer, and avoid the problem of forgetting everything over the summer. Khan Academy has helped my students learn math.